The Honor 6 comes with 16GB of internal storage, so for those who would like to carry round a lot of media the ability to expand on this will be welcome. Up top you’ll find the headphone jack, while on the base of the Honor 6 you get the micro-USB port. The 5-inch full HD display is bright, clear and welcoming – video playback will be pleasing thanks to the 445ppi, which bests the One-Plus One and its larger 5.5-inch screen. Screen quality looks to be up there with the high-flying full HD handsets currently on the market, so even though the Honor 6 is arriving at half the price of the flagships it certainly doesn’t disappoint here. There is a plenty of power under the hood of the Honor 6, and it’s in charge of running Android 4.4.1 KitKat – although that has been covered by Huawei’s Emotion UI 2.3. The interface has been improved considerably since it debuted a few years ago, but it still feels like it’s lacking when compared to the likes of Samsung’s Touch Wiz, HTC’s Sense and stock Android. Icons still look more childish than professional, and the removal of the app draw completely will put some dedicated Android fans off. 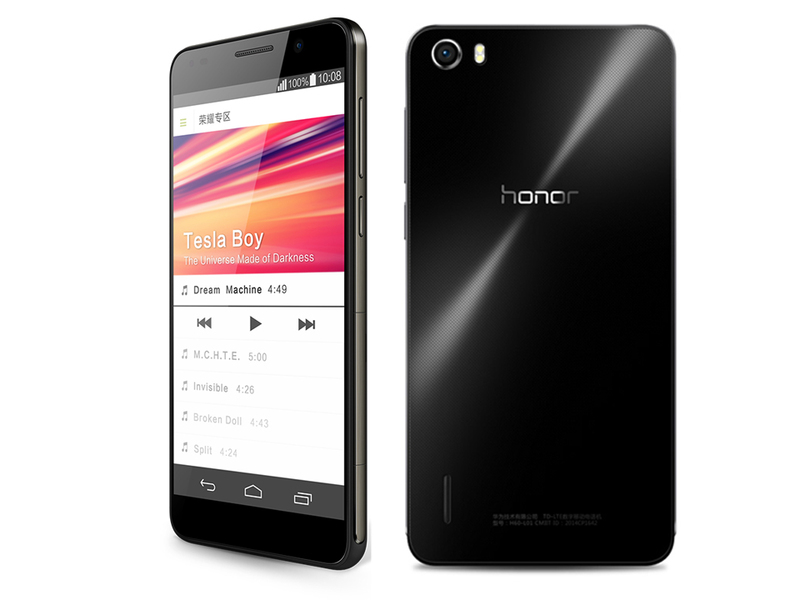 The Honor 6 is very quick and responsive. You will be able to easily sweep through home screens, apps loaded in good time and you will never experience any obvious lag. It will be interesting to see if it can keep up the same slick performance once stuffed full of apps, games, music and movies – but early signs are positive. On the rear you get a 13MP camera located in the top corner of the device, alongside a dual-LED flash, and the placement is reminiscent of iPhone and Sony Xperia handsets. It boasts a 0.6 second ultra fast snapshot function, letting you grab a snap without even unlocking the phone or opening the camera app. A double press of the volume key in standby mode will enable the snapshot feature on the Honor 6. Even in the unconventional lighting of the display area the Honor 6 was able to take sharp, in focus snaps which impressed. Meanwhile on the front there’s good news for selfie fans as a 5MP lens sits above the 5-inch display, complete with panoramic selfie which lets you get more of your mates in. The Honor 6 makes some impressive battery claims, and it comes with Smart Power 2.0 technology which will apparently give you over two days usage on a single charge. You cannot remove the battery inside the Honor 6 – so no swapping it out for a fully charged replacement once it dies. There’s also an ultra power saving mode which kicks in when the battery level of the Honor 6 reaches 10%. It automatically switches off data and switches the interface to a simplified offering with just the dialer, contacts and messaging apps available. You’ll have to wait for the in depth Honor 6 review to find out if it really can live up to the bold claim, or whether it falls short.